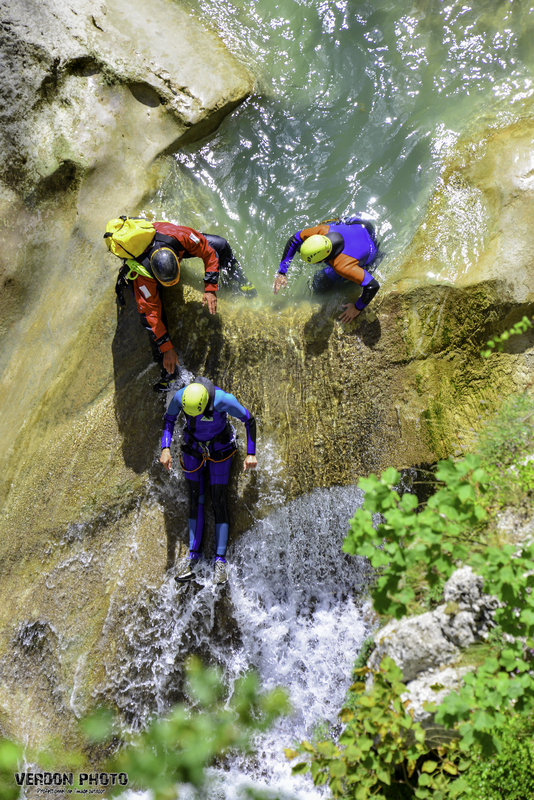 Canyoning is a sport that has faith in the water and climbing. You progress to the heart of a canyon (a narrow hollow by the river), swimming, jumping and bypassing all the obstacles by sliding on natural slides, and descending with the help of ropes under the waterfalls. A specialist guide in climbing will secure you with the help of a safety harness and rope and will teach you the technique of descent. The following items will be at your disposal: safety harness, ropes and climbing equipment, helmet, neoprene wetsuit, neoprene jacket or windproof jacket, neoprene socks dependant on the season, backpack and sealed water bottle. Previous experience is not necessary however you must be able to swim, be a minimum of 10 years of age (minors accompanied by an adult) and bring with you a swimsuit, a towel and a bag. Sport shoes must be worn however they may go in the water. CANYONING IS FEASIBLE EVERYDAY EXCEPT ON THE DAYS WHEN THERE IS INSUFFICIENT WATER. THE RATE OF THE WATER IN THE VERDON IS REGULATED BY THE EDF DAM (Chaudane/Castillon). THEREFORE THERE MAY BE CHANGES TO YOUR RESERVATION.